I have a love/hate relationship with skiing. I didn't go skiing for the first time until I was over 30 and since then have only had two other ski trips. Our family this past month enjoyed a few days of skiiing in northern Spain. The weather was great and it was amazing to see how the kids especially Big D have improved. 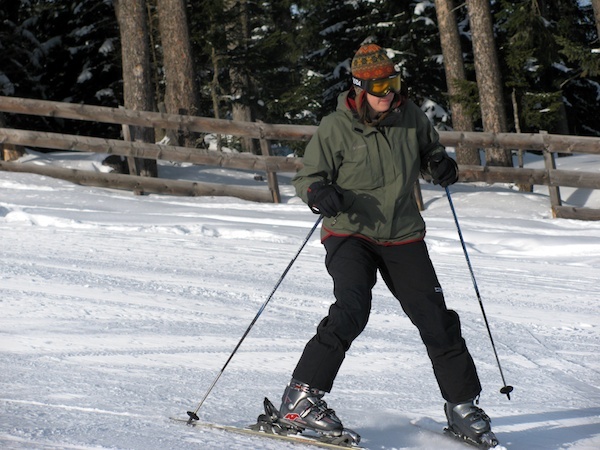 I thought I would share a few lessons I have learned from my skiing experiences. 1. Freaking out does not help you ski better or get down the hill faster. I would say overall I did better this trip but this lesson could still use some work. Lysa talks about this some in her skiing experience post. I think this lesson works for all of life. 2. Start small. Stay on the bunny slope as long as you need to. Don't let the excitement of your family get you on a slope that you and they will regret. In life, we want to dive into projects all at once when maybe small steps are best. For example, when I started learning to crochet I made a bunch of dish clothes practicing the stitches before moving on to other projects. Another example is exercising. Start with less and work up to more. 3. Concentrate on the what is in front of you instead of the whole slope at once. When I just looked at each part of the slope and took my time, I was able to successfully make it to the bottom. When I looked too far ahead I would freak out or lose my focus. It was less stressful to just take the slope a turn at a time. In life, we can often get overwhelmed by a task that seems impossible. I have two teens and the task of getting them through the teen years seems a bit daunting. If I focus on today, I can do today with God's help. Tomorrow will come soon enough. Scripture memory works best this way also. The kids and I finally finished memorizing Colossians. When we first started, they thought it was impossible but as we took each verse and each chapter one at a time, it was doable. 4. Comparing yourself to others makes life less fun. Skiing is fun when I take my time and just enjoy being outside and with my family. If I start to worry about being too slow or not as good as others, it saps all the fun out of our time together. Enough said. 5. Trying new things makes you humble and is exciting. Learning new things makes life more fun. It can be hard but the feeling of making it down the slope without falling and right behind your children is amazing. Now if I could just feel that way about learning a new language. 6. You will never make it down the hill if you don't get back up after you fall down. Sometimes I wanted to just stay down when I fell but it would have gotten cold pretty quick. God always seemed to send someone to help me get back on my feet just when I needed it not only on the slopes but in real life. 7. Know your limits. This trip W and I stopped skiing just after lunch. We were tired and were able to enjoy each day better that way. I was also able to walk the next day and wasn't as sore. I am getting better at this in other areas. Learning to say no when our family needs a break helps keep us sane and healthier. Yea! You finished Colossians! That is wonderful! Your lessons from skiing are excellent. Thanks for sharing your insights!